Express News 24/7. 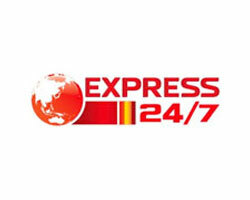 Watch online Express 24/7 news channel live broadcast. Express 24/7 is owned by Television Media Network (Pvt) Limited or the Lakson Group. It is also a sister channel to the famous Express News TV channel. Express 24/7 was launched in 2009 and is basically an English News channel. It has its headquaters in Lahore, Pakistan. The main broadcast regions of Express 24/7 include South Asia and Middle East. Although recently launched, Express 24/7 has done well to compete against the already existing English News channel; Dawn News. Both news channels are trying hard to provide quality news in English News. However, Express 24/7 is a little edge over Dawn News as its Network has been working for quite some time. Express News, Daily Express (the newspaper) assist 24/7 in its reporting. Now you can watch Express 24/7 live online and stay update with the events that take place around you.